Talks about iBeacon technology have never stopped since it’s introduction in the World Wide Developers Conference (WWDC), June 2013. This technology, that can be used to deliver path-breaking customer experiences and generate more revenue in retail stores, museums, hotels, malls, theme parks, airports etc., is poised to be the most disruptive technology in recent times. 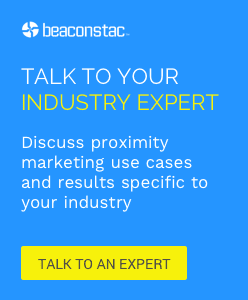 While various verticals continue to trial and test beacons for their businesses around conventional use cases, there have also been quite a few innovative implementations built around the less obvious ones (use cases). In this post, we will discuss three such examples, where the novelty of ideas impresses and excites us! No parent would like to see their child fall sick and then further aggravate the child’s discomfort by taking constant temperature readings. But, what if temperature monitoring could actually be a soothing experience for the baby? Enter Pacif-i – a smart pacifier that monitors a baby’s temperature and then transmits the data to an app on a parent’s iOS or Android smartphone or tablet. The device has a thermometer built into its silicone teat and a Bluetooth chip that sends temperature readings to a paired smartphone. The app determines when the temperature is most accurate and then timestamps and plots the temperature data in a graph. Through the Pacif-i app for Android and iOS, you can view a live temperature reading and see previous readings in a timeline graph. This enables you to track any improvement or decline in the child’s condition. This data can also be easily shared with others – say your spouse or your doctor. Also, in case the child is on a course of treatment already, you can set dosing reminders from within the app. Taking a child’s temperature isn’t the only thing that the device does. The device also features an in-built proximity sensor that allows parents to monitor the pacifier’s location and thus be alerted when their child wanders off a certain predefined threshold distance. Parents can set the distance up to a range of 20 metres, inside the app. An alarm is thus triggered when the pacifier crosses this distance. The way it works is, the Pacif-i app makes a note of your last known location using your phone’s GPS, and points you in the direction of your child. Another useful feature is a buzzer alarm that can be activated via the smartphone when it has been misplaced or hidden by your child. With a battery life of more than a year, this is one device that parents will love. While many think this is a case of taking (IoT) Internet of Things a little too far, no one seems to be complaining! Students of Wellington Institute of Technology (WelTec) in Petone, New Zealand have devised a smartphone app called ICY that will help the visually impaired access information on their surroundings. For the Jackson Street Programme (JSP), an incorporated society set up in 1993 in Petone, the ICY system brings alive the street’s history for people who can’t read the plaques and signboards on notable buildings. The JSP promotes Jackson street as a destination for shopping, eating out and socialising, and organises promotional and community events. Visually impaired users will be alerted to detailed voiced information on what’s going on around them when they visit a place, via a smartphone. -It listens for beacons placed around the street and when it finds one, it gets information associated with that beacon’s ID. -The information appears as words on the user’s smartphone screen and is relayed via the phone’s voice-over function. The system is being trialled using beacons for six key functions: major intersections and pedestrian crossings, street hazards, facilities such as post office or banks, building interiors, bus stops and railway stations, and heritage features. Two levels of data will be made available to users. The first function is to alert people when they pass a iBeacon. This will be a voice alert. If they wish to know more information about that location, they can tap their phone. While the website and database is up, the full launch in Petone, New Zealand is due in about two months. The app is all set to truly revolutionize the lives of visually impaired. CardFi is a personal assistant that takes care of all your contact management and networking needs. It’s an iBeacon integrated device and mobile application. Both the options carry the same CardFi ID and is an on demand service, meaning you can activate it when you want to exchange a business card. The way it works is, a user will just turn on his/her CardFi (Device or App). All the people in the user’s proximity will receive a notification with his/her details. Once they add the user and the user confirms the request, they have (virtually) exchanged business cards. CardFi can even save details such as the location, time and with whom the user met, in the “Cloud”. It’s easy to follow and manage, and one can also immediately add notes and reminders on each contact added. It can also be synced with all other contact services as Google, Linkedin, Outlook and many more. Thus, the opportunities that beacons provide are limitless. Looking at the scope beacons have for disrupting various industry verticals, these tiny devices truly have the potential to be an integral part of any business’s digital strategy in the near future.